Worried about overpaying for your diamond? As a reader, you’re likely embarking on the world of going from “significant other” to “very significant other”. As part of this journey, there will be plenty of opportunities when a small, well-thought, gift will help take their breath away and keep the fire going (or get you out of the dog house should the situation arise). Our goal at The Diamond Advisor has always been to help you get the best diamond possible. In celebration of the important events that will follow your engagement and wedding day, we decided to take a break from our usual goal to share what you can expect when purchasing a jewelry gift from one of our favorite online retailers – Blue Nile. This online jewelry review will give you a glimpse into the shopping experience you can expect when purchasing jewelry online with Blue Nile. We’ve order from Blue Nile on more than one occasion and have provided our review of the whole experience. We hope that it will helps answer many of the questions that are no doubt top of your mind and leads you to finding the perfect gift for her. Blue Nile is one of the largest vendors when it comes to buying diamonds online. Although we seldom select stones for our readers from Blue Nile due to their drop-ship policy and lack of real diamond images, they remain a favorite vendor thanks to their wide selection of high quality jewelry that provides exceptional value without breaking the bank – everything you need following the big wedding day! Blue Nile carries a wide, and very nice, selection of jewelry and gifts to meet any occasion. From earring to necklaces, bracelets and gemstone rings and jewelry, we felt pretty covered in whatever we were looking for. Having said “Yes” and as a gift idea for her, we decided that a tasteful necklace would speak volumes either as a beautiful wedding day gift to complement the gown to as something elegant to wear thereafter. BUYING TIP: Readers often ask us “is it worth spending an extra hundred or two hundred dollars between two diamonds of identical performance?”. Our answer is to always save the extra bit of cash and save it for a nice little gift. On the Blue Nile website, we were presented with many necklace options ranging from diamonds to pearls to gemstones and even an option to build your own pendant. With a modest budget in mind, we opted to start our search with a pearl necklace. Despite our fascination with gemstones, we didn’t want a gemstone gift to overshadow the recent diamond gift and also figured that a pearl necklace was a great compliment to almost any outfit, wedding dress or evening dress. One of the aspects that jumped out at us was the large selection of jewelry gift ideas available. Apart from Blue Nile’s bread and butter of diamond and gemstone based necklaces, there were also a wide selection of pearl and metal (gold, silver, platinum) necklaces and engraveable necklaces (with several options under $100). After a little bit of browsing, we opted for a gift with pearls due to its timeless style, reasonable price and the fact that it’s something she could hold onto and wear to a nice occasion without being over the top. Admittedly, we went into this shopping experience knowing close to nothing about pearls and it left us wondering how much time we’d need to invest in googling to figure out the difference between Akoya, Freshwater and South Sea pearls and why we should pick one over the other. Thankfully, Blue Nile had us covered in this respect. As mentioned earlier, Blue Nile does a great job in organizing their site and navigating over to the ‘Education’ section uncovered just the right amount of information that proved invaluable in making our choice (and more importantly saved us from googling dozens of websites). Apart from the above, the education section contained a dedicated page for each type of pearl which helped us get informed to the point of making our decision. After getting educated on each type of pearl, the Akoya pearls were the obvious choice for this gift – being the “speciality of Japanese pearl farms”. In comparison, freshwater pearls, which are similar to Akoya pearls, typically originate from China and are available for a much lower price making for good quality and exceptional value. 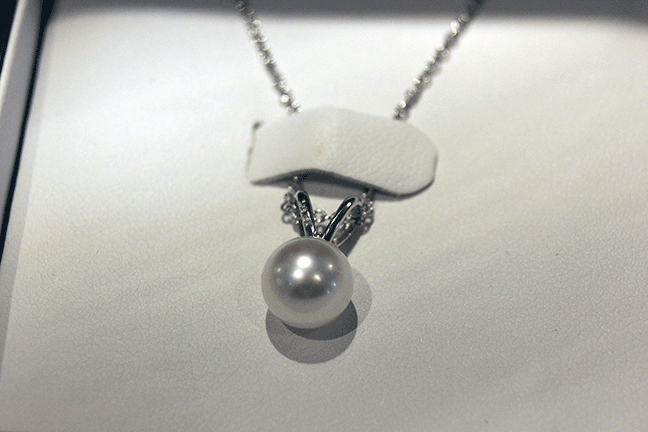 Fully educated, and with the thought of highly crafted Japanese things in mind, we returned to the pearl section to browse for Akoya pearl jewelry. BUYING TIP: Like diamonds, larger pearls command a premium as they are rarer in nature. Now that we knew what we had in mind, finding the perfect gift for her was easy using the product filter we had found before. Highlighting Akoya from the ‘pearl type’ left us with a handful of options. After reviewing the choices and keeping our modest budget in mind, we decided on the Akoya pearl pendant for its simplicity and style. When it comes to online shopping, there are two things we always look for: shipping or duty costs and reviews. There’s nothing worse than getting hit with unexpected shipping charges or not getting what exactly what you think you’re buying. In both these cases, we found that the Blue Nile website did a great job of setting our expectations. In terms of shipping, “duty free” was clearly called out which gave us a sigh of relief (we really dislike paying unexpected duties!). This, along with the 5 star reviews from other shoppers, gave us the confidence that we weren’t in for any unexpected surprises or disappointments. All and all, we liked the Blue Nile reviews on the pearl pendant and decided to pull the trigger. One of the things we noticed after adding our pearl pendant to our cart was that we were immediately given an order number. This isn’t something we see often but know it’s extremely useful as something to reference if (or when) we have questions for the Blue Nile team. Now, although we knew the answer, we actually did call Blue Nile customer service inquiring about what exactly “duty free” meant. Getting access to a live customer service person was quick and painless (easier than we had expected). On the phone, we were prompted with a simple option selection (“1” to talk with a diamond and jewelry specialist and “2” for other questions including technical help). As our question was more of a shipping question, we opted for technical and pressed “2” and were immediately connected with Alexis, our customer service representative. Alexis was quick to answer our duty free question and clarified that it was in fact “all in, no surprise charges” which was reassuring. Alexis also offered to help with the order if needed (using the order number we saw onscreen). This seamless continuity between the website and the live shopping experience was a nice touch – something shopper trying to keep a low profile could definitely benefit from. Jotting down the order number of the cart means you can finish you order via the phone at a later time if ever needed. Save with Blue Nile Promo Coupon Codes: On the shopping cart page, there is a place for promo codes. Unless you’re in an absolute rush, it’s always handy to search the web for a promo code to save a bit of cash. Need a Blue Nile Promo Coupon Code? We frequently get Blue Nile promo codes which we share with our readers. Check out our coupon page or reach out via our Contact Us page. Don’t forget to mention whether it’s for a diamond or jewelry purchase! As we’re a big fan of PayPal, we chose to go that route which directed us to the all so familiar PayPal payment portal. We noted earlier in our shopping experience that your basket price appears as a header to the page. We liked the fact that this information followed you all throughout the checkout process to ensure you knew exactly how much you were ordering. Again, not a novel feature but just something for peace of mind! The last step in the checkout process was double checking all the details including when the product would ship. This is a small but overlooked feature. For those who don’t have the benefit of having something shipped to the office, knowing when a product will ship out helps in the mental math of when it’ll arrive at your home so that you can intercept it and keep the surprise. As everything looked good, we placed the order and started the countdown to when our surprise gift would arrive! Our gift arrives on time thanks for same day shipping! As promised, our Blue Nile pearl pendant shipped out the same day the order was placed and arrived at our doorstep in an unassuming FedEx box. Given that we’re north of the border and on the opposite coast, we were impressed by how quickly our package arrived (things typically take a day or two extra when compared to shipping within the continental US). According to the package, our order shipped from Seattle (Blue Nile Headquarters) all the way to the east coast and across the border in a day. Pretty damn good (and handy if you need a last minute gift)!! As Alexis had promised the package came with no hidden surprises in terms of duties or other charges. The only other reference was a printed barcode with a “BN-” prefix. This BN-xxxxx was our order number for easy reference. Our box came with several documents enclosed within the sealable invoice pouch. Opening the pouch gave the first hint that this package was in fact from Blue Nile. I did notice that the (folded) document was put in such a way that the Blue Nile header logo would not be visible when looking at the box. Again, a small little touch that helps keep the surprise. The documents within the pouch were the typically commercial invoice you’ve come to expect with courier shipments. Note that the price was included in the shipping document (though this may have been due to the fact that it crossed the border). Inside our FedEx box was another envelope – a FedEx Padded (bubble) Pak to keep our gift safe and dent free. Upon opening our bubble pak, we got our first glimpse at our Blue Nile presentation box (and several pieces of documentation in an insert for safe keeping). Fold out jewelry care guide covering diamond, gemstones, pearls and precious metals. Our pearl pendant came in is a blue snap-close presentation box with the Blue Nile logo inset in to the top. In our opinion, the box is a little unassuming and could have been a bit more flashy and high-end looking, perhaps with the logo in silver. Opening the box made up for the unassuming cover with its clean lines, white backdrop and blue logo. 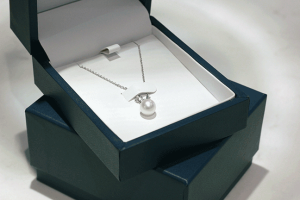 Our pearl pendant was elegantly displayed with the small pouch in the back to ensure the chain didn’t run freely and give away the surprise before it could be opened. 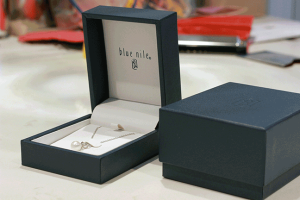 Also included is a Blue Nile gift box which fit the presentation box very well and also had the logo inset in the top. All and all we were happy with the presentation and quality of the packaging. Having never actually bought pearls before, we were happily impressed with our first impression of Blue Nile as a jewelry gift retailer. Having seen pearls before in brick and mortar retail stores, it was clear the gift in front of us was of high quality. The lustre, shape and slight rose color of the pearl coupled with the white gold made for a great impression. Knowing that we could get a high quality gift for her without the inflated prices of traditional jewelry stores made us immediately turn our thoughts to ordering the matching earrings – which we did 2 weeks later and were also impressed with! As a shopper looking for jewelry as a gift for her, we were happily surprised with the elegance and quality of the piece we ordered. Add to this the wide range of different jewelry pieces, fast shipping, excellent customer service, clear reviews and overall straightforward shopping experience, Blue Nile remains a Diamond Advisor favorite vendor when searching for the perfect gift for her. 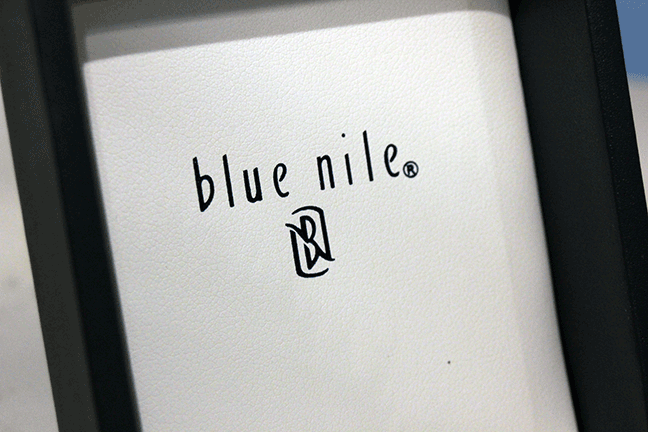 Buying from Blue Nile will certainly make you a repeat customer for all of life’s little occasions. Have a diamond in mind and just need a second opinion? No problem. Leave a comment or contact us using the link below. We'll get back to you within 48 hours. Found this site and it's information helpful? We certainly hope so! Help show your support by joining our Facebook Group - Engagement ring discussions, photos and more! Buying a loose stone online and can't decide between two similar diamonds? The Holloway Cut Adviser can help you choose by estimating a diamond's appeal based on its potential Light Return, Fire, Scintillation and Spread. Copyright © 2017 The Diamond Advisor. All Rights Reserved.